Parker County officials are asking residents in flood prone areas near the Brazos River to voluntarily evacuate before the river crests Thursday. Judge Mark Riley and Emergency Management Coordinator George Teague said in a news conference Wednesday afternoon they were asking all residents in the southern Parker County neighborhoods of Mountain River/Soda Springs, Horseshoe Bend, Hillbilly Haven and Lazy Bend Estates to evacuate by 8 p.m. Wednesday. Officials estimated as many as 350 homes might be be affected. As of 7 a.m. Thursday, officials said no homes had flooded. "We want to emphasize again the fact that people need to go ahead and evacuate those flood prone areas along the river," Riley said Wednesday night. "Back in '07 we had people that refused to leave and our emergency services personnel ended up going out ... trying to rescue somebody on top of a house who refused to leave ... we destroyed a $7,000 boat in the process. They need to be sensitive to the lives of our emergency personnel." 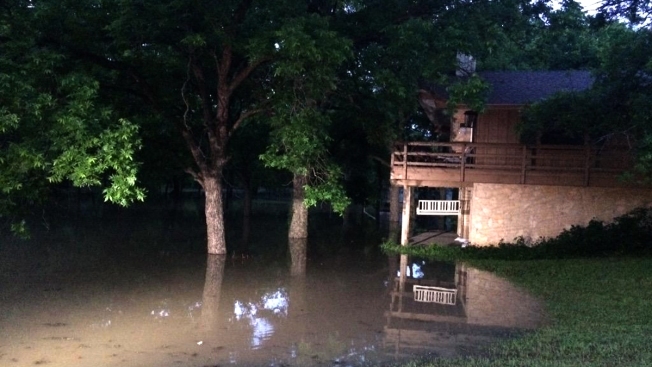 Parker County officials asked people who live near flood prone areas along the Brazos River to voluntarily evacuate. Due to rain and water being released from Possum Kingdom Lake, officials said the river is expected to crest Thursday afternoon at about 23.6 feet. The river's record high is 31 feet, officials said. In 2007 it hit 27 feet. "The problem is, of course, as the river rises it gets wider. It may quadruple the width with only 10 foot in height," Teague said. Teague added that the river level will be dependent upon how much rain falls Wednesday into Thursday. Riley said he's already signed a disaster declaration and will sign a voluntary evacuation order later in the day to emphasize how serious the flooding may be. County officials have staged equipment and manpower around the county to prepare and assist those who need help relocating. Roads will be barricaded as needed and Riley said they will pull emergency personnel at about 8 p.m., further enhancing the need to get out ahead of the 8 p.m. deadline. "I do not want to risk firefighters' lives for someone who did not use good judgment. They were told 12 hours in advance to get out," said Teague. Authorities are urging residents in flood-prone ares near the Brazos River in Parker County to voluntarily evacuate before the river crests. School buses left with some residents Wednesday evening before utility crews were forced to shut off power to homes nearest the water. "As the water rises, and it gets into electrical boxes, they shut it down. Tri-County shuts down the electricity on those grids," said Parker County firefighter Rick Brown. While it is the hope of county officials that residents will leave with their domestic and livestock animals, they are prepared to help move and house those animals as needed. The city of Weatherford will assist Parker County Animal Control with adoption trailers and removing animals, according to Karen Kessler, Parker County Animal Control. County officials are asking residents to only call 911 for life-threatening issues. For all other questions, including evacuation routes, domestic and livestock evacuations, please call 817-594-3213.